Thousands expected for classes, musical prayer gathering and more. One of the highlights of the year at the Cave of the Patriarchs is the central Slichot class, founded by Chief Rabbi Mordechai Eliyahu zt "l more than 20 years ago. 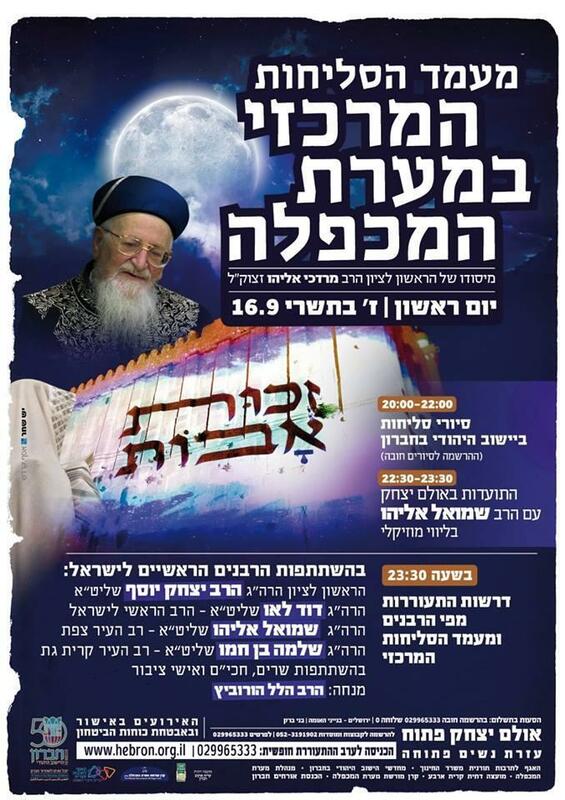 This year, his son, the Chief Rabbi of Tzfat Rabbi Shmuel Eliyahu will be in attendance along with Chief Rabbi David Lau, Members of Knesset and thousands of good people from all over the country. The 'Touching Infinity' visitors center will be open. For information call 072-221-3660. Sunday September 16, 2018 / 7th of Tishrei - The Hall of Isaac, the largest in the Tomb of Machpela complex will be reserved for Jewish prayer from 4:00am until after midnight when Selichot classes end. * 8: 00pm - 10:00pm - Tours of the Jewish community of Hebron. Advance registration need. Call 052-319-1902. * 10:30pm - Musical prayer gathering with Rabbi Shmuel Eliyahu in the Hall of Issac. * 11:30pm - Words of Awakening and the central Selichot class in the Hall of Issac. Special women's classes and prayer gatherings will be held throughout the day and night. For more details and transportation information call the office at 02-996-5333. * 10,000 Visit Tomb of Machpela for "Hilulat Haavot"